"Too much of a good thing..." - That's the message that many passive investors are unknowingly dealing with as they approach the year-end. In 2012, FANG Stocks (Facebook, Amazon, Netflix, and Google) accounted for less than 3% of the market cap of the S&P 500. 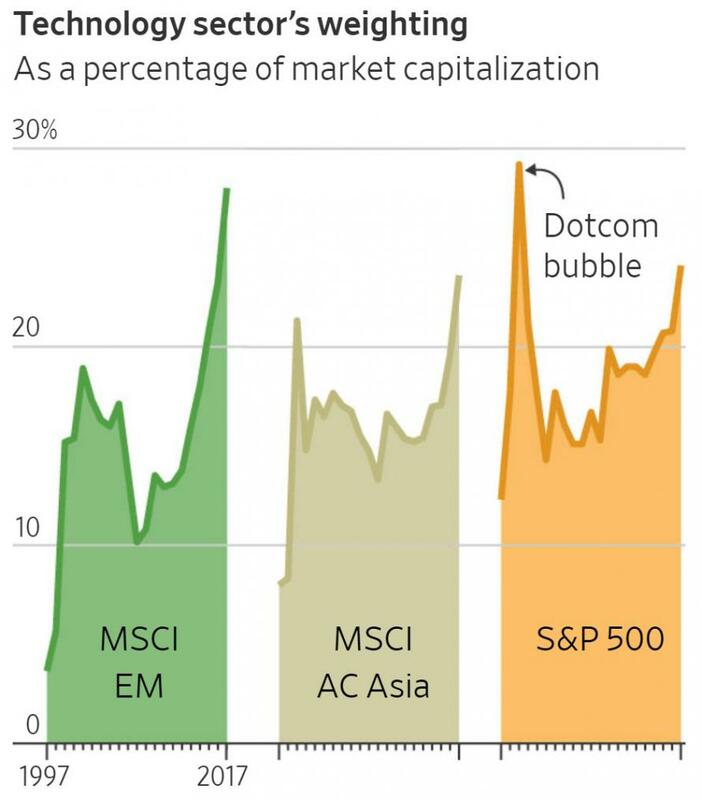 And, as WSJ reports, this is not limited to a small handful of stocks, it is worldwide - investors who loaded up on U.S. and Asian stock-index funds might be surprised to learn just what they own now: technology stocks - a lot of them. 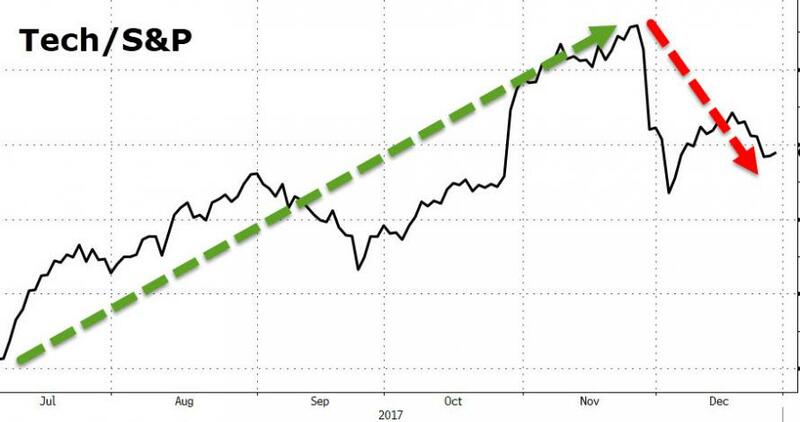 Led by Apple Inc., Facebook Inc. and their peers, the weighing of technology stocks in the S&P 500 index has climbed to 23.8% as of Dec. 26, from 20.8% at the end of last year, according to S&P Dow Jones Indices. Three years ago, tech stocks had a 19.7% weighting in the widely used U.S. stock market benchmark, which is currently tracked by funds with more than $2 trillion in assets. Over the past 10 years, the weighting of the tech sector in the S&P 500 at year-end has averaged 19.6%. The same is true in Asia, where surging tech stocks have powered sharp gains in Hong Kong, South Korea and other markets. The weighting of technology stocks in the MSCI Emerging Markets Index, whose components include Chinese e-commerce giants Tencent Holdings Ltd. and Alibaba Group Holding Ltd. , was 28% as of Dec. 21, from 23.3% a year ago. 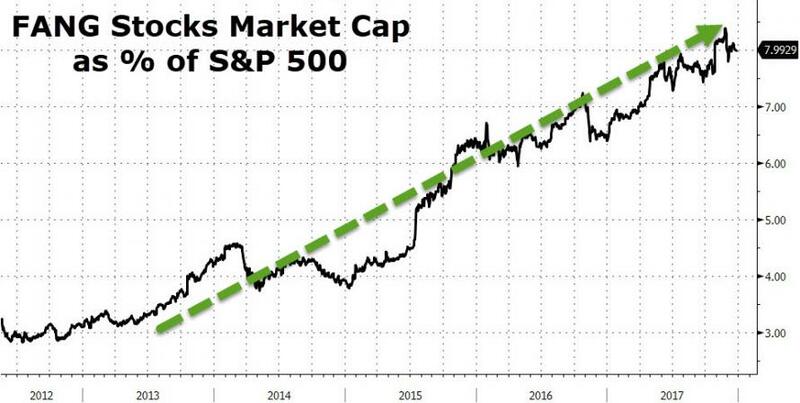 “It’s sort of an inherent flaw of index funds,” said Kyle Moore, founder of Quarry Hill Advisors in St. Paul, Minn., referring to the way surging stocks have a bigger share of indexes that are market-value weighted, like the S&P 500. Noting that some tech stocks have gained nearly 50% this year, Mr. Moore said a typical investor response would be to trim exposure to those stocks and take profits. When that happens in an index fund, nothing happens automatically, he said. A pullback in the sector will have a bigger impact on the broader market, but arguably many investors in index funds have accepted that is what they signed up for when they chose to invest passively.